Here are a few tips on photographing Poinsettias during the festive season. So Christmas is around the corner which means Poinsettias will be filling every supermarket and these relatively cheap plants make great photographic subjects. Particularly on wet, cold days when all you want to do is stay indoors with the heating on! 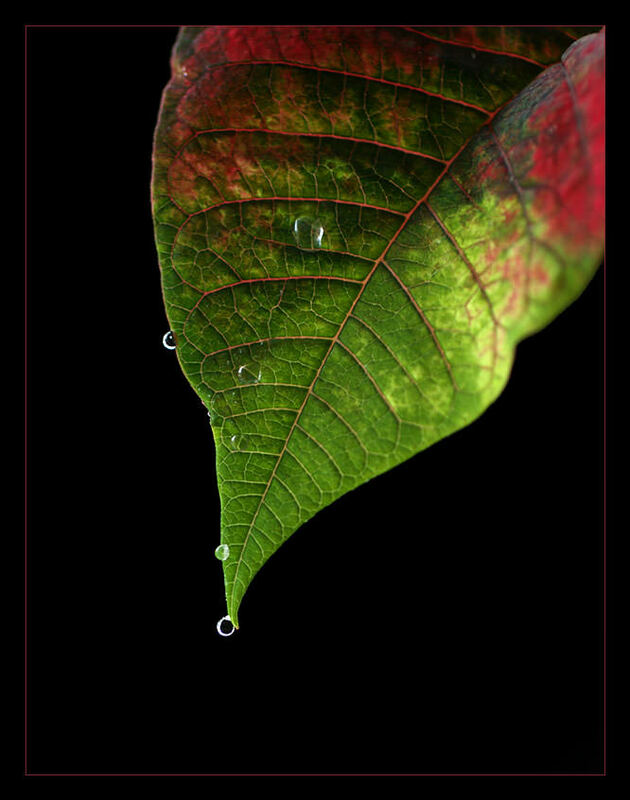 Spray bottle - spray the leaves and photograph the drops of water as they fall off the leaf. Although it's an attractive plant as a whole, you'll get more interesting shots if you concentrate on the details. Look closely and buried amongst the foliage you will find plenty of multi-coloured leaves. It's easier to work with your chosen leaf away from the rest of the plant so pick the leaf off and move it to your chosen work surface. The sap can be an irritant so you may want to use a pair of scissors to remove the leaf. A windowsill is a good place to set-up as plenty of natural light will be able to fall on your subject, plus you can stick your background to the window (a piece of paper will work fine) which will mean the light will fall through it. The key to this is experimentation as no one position or angle will work every time. You want the light to come through the leaf but preferably not directly onto the front of it. The same applies to black backgrounds. Simply leaned it against your window, angled so that the sun doesn’t shine on the background, with the leaf to one side allowing the sun to shine through it. If you don't have a window that's easy to work in front of, try using a modelling light as your light source or alternatively, any kind of adjustable lamp should do the trick. You don't have to concentrate just on the leaves – try cutting a stem from the plant and place that in front of the light as well. In this case, a sheet of white card comes in handy to bounce a bit of light back onto the unlit side. Lastly, when the plant suddenly decides to wilt, simply cut the stems from the plant and put them in water. They will perk up in a few hours and then last at least a week allowing you to gets lots more of leafy images.